Below are genuine customer reviews and testimonials. Thank you to every one of our customers who have taken the time to comment on our services. We appreciate it greatly! 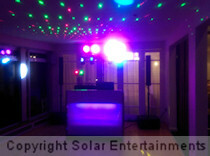 I booked Solar Entertainments for my daughter's birthday on Christmas Eve. 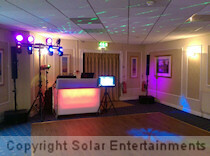 The DJ was fantastic, on time he did a great job, friendly service and the price was brill especially for Christmas Eve. Thanks very much, will be booking again and will be recommending!! Dave was really helpful and provided a fantastic service. 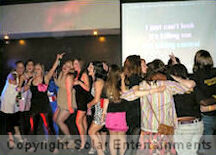 We had a great disco and I wished it could have gone on and on. Really happy with Dave's service. All was explained and was easy to set up with written instructions supplied. Loads of different folders and ways of finding songs that you want to sing. It was my 40th birthday party and this made it more special. Definitely recommend. Thank you Dave for a fantastic disco last Saturday at our joint 40th/50th. Everyone loved the music and thank you for following our playlist! Would definitely recommend/use Dave again. Dave's service was highly professional, efficient and friendly. The karaoke, song books, lights and microphones were great. Dave set everything up and left me with easy instructions. The whole thing entertained us for two evenings and there was an inexhaustible list of songs. Worth every penny - brilliant. We used Dave for our wedding party and, without hesitation, I would say he was a huge success! 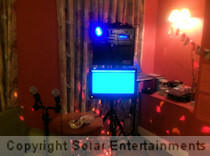 He gave us 4 hours of DJing with karaoke interspersed and we and our guests had so much fun. Dave was great value for money and so easy to deal with. We arranged all details via email and he was always courteous and interested in only providing the night we wanted. Dave set up his gear (which was fantastic for the karaoke!) and liaised himself with the venue on how to do this which, when organising a wedding, is a Godsend! We can not speak highly enough of the night provided by Dave and would recommend him to anyone for any occasion! Thank you to Dave for a lovely night of music, karaoke and dance for my husband's party. He accommodated for all ages and very obliging. A particular huge hit with the children, they danced and sang the night away and didn't sit down all night! Will definitely recommend Solar Entertainments and will be making a booking for our 40th wedding anniversary in the near future. Just wanted to say thank you for Friday night! Everything went really well and you had just the right balance of music to keep everyone happy! Sorry I didn't get to thank you personally at the end of the night. We hired karaoke equipment for a small hen do and were super happy with the service! All interactions were quick and professional and Dave did a fantastic job of getting us set up! A great experience - thank you!! :-) I thoroughly recommend. 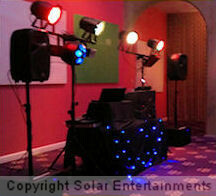 We have recently used Solar Entertainments for my friends Hen do. Dave was really responsive and really easy to work with. The equipment was easy to work and was just the thing we needed. Would 100% use the service again and would highly recommend. Really impressed with the whole service! Dave was very quick at responding and very professional. 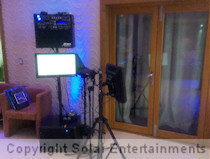 I hired it for a hen party with wireless microphones and lights, we had loads of fun. It's definitely worth the money and had a great choice of songs and the equipment was easy to use! Would definitely recommend. Also great he delivers and picks up on time! I booked Dave for a disco and karaoke. The party was fantastic. Dave arrived extremely promptly and was a brilliant DJ. He even went over the scheduled finishing time to fit in more karaoke requests. Everyone had a great time. Would definitely use again. Thank you very much. Dave supplied karaoke equipment for my wife's 40th birthday party. He was punctual in both delivery and collection and explained everything very clearly. The equipment worked beautifully and a good time was had by all. Everyone enjoyed the party and the music selection was perfect for the event. The DJ David was very approachable and dealt with the event from start to finish. 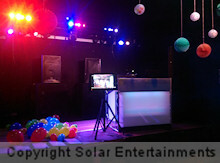 Highly recommend Solar Entertainments for your party. Great service, great quality, really accommodating. Karaoke system for Hen Do at a house. Great set up and collection. Great equipment. Great song selection.